History is an argument about the past. Use this interactive poster to begin a conversation with students about what we know about the past—and how we know it. The poster is divided into four quadrants. Hover your mouse over a quadrant to highlight it and click. When the image of that quadrant appears, click on a bullet to learn about the image and find related learning and teaching resources. Are you an elementary teacher? Click here to visit our elementary poster! Click here to visit our Civil War poster! Hover your mouse over a section, click, and then click on a bullet to learn about the image and find teaching resources. Consider the 1860 census. What questions did it ask? Why and how was it taken? Who filled it out? How did the U.S. government use this information? Source: Census data, 1860, United States Historical Census Browser. Why did Alice Williamson, a Tennessee schoolgirl, keep this diary in 1864? How long did she keep it? Was it private or did she intend to share it? Source: Diary, Alice Williamson, 1864, Duke University. What details does this map show? Who created it and how? Who might own a map like this and how might they use it? Source: A New Map of Tennessee, Samuel Augustus Mitchell, 1857, Birmingham Public Library Digital Collections. When you look at a source, ask, "Who wrote or created it? For whom? Why? When and where did it appear? How was it used? Where was this source discovered?" 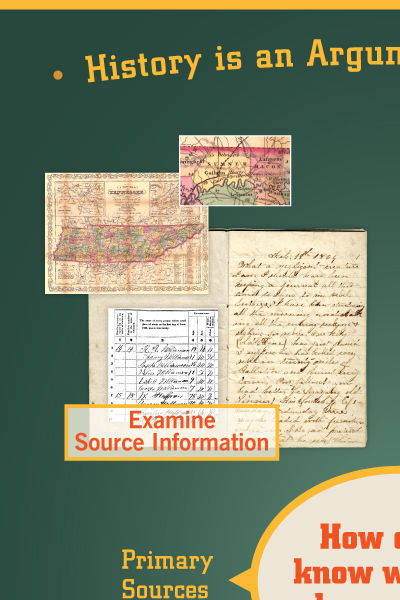 Primary Sources: What Are They? Examine this lithograph section by section, piece by piece. What do you see? How do the elements relate to each other? Source: Lithograph, Westward the Course of Empire Takes Its Way, J.M. Ives, 1868, Bancroft Library. The “stuff” of history—texts, images, music, film, data, or objects—can help you learn about the past. What kinds of clues can you gather from these sources? 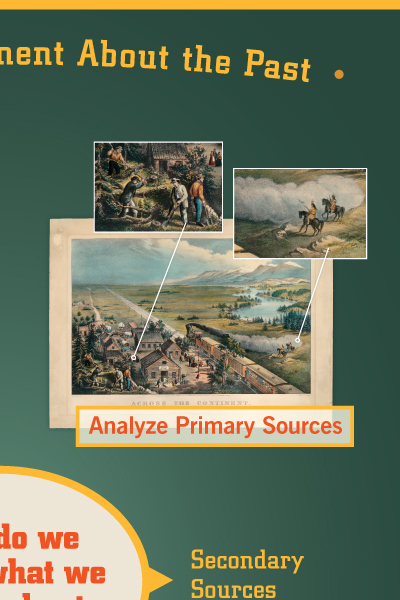 Secondary Sources: What Are They? When making a historical argument, always use evidence to support your claim. What does this photograph of Rosa Parks say about the 1955-1956 bus boycott in Montgomery, AL? Source: “Woman Fingerprinted. Mrs. Rosa Parks,” 1956, Library of Congress. 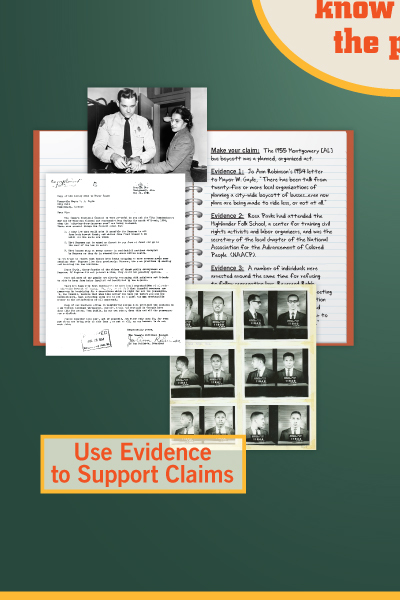 What evidence could you use to research other protests during the Civil Rights Movement? What Is an "Inquiry Lesson"? Source: Mugshots, Civil Rights Protestors, 1961, Montgomery Public Archives. After examining one source, ask where else you could look to learn more about this topic or event. Then compare multiple sources. Where do the sources agree? Disagree? Why? Multiperspectivity: What Is It, and Why Use It? 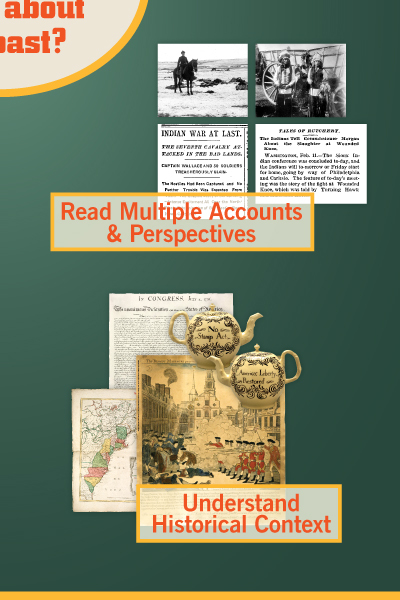 How do accounts of battles (and peaceful meetings) differ depending on who tells the story? This broadside shows one view of the Boston Massacre. What led up to this event? What was happening elsewhere in the colonies? Source: “The Bloody Massacre Perpetrated in King Street Boston on March 5th 1770 by a Party of the 29th Regt.,” Paul Revere, 1770. What influenced the writers of the Declaration of Independence? What was the broader historical context? Source: Declaration of Independence, 1776, National Archives and Records Administration. Why would colonists buy this teapot? How is the Stamp Act related to events like the Boston Massacre or the adoption of the Declaration of Independence? Source: “No Stamp Act” Teapot, 1776, National Museum of American History. Why was this French map made? What events were taking place in the colonies when it was created? Source: Carte Nouvelle de l’Americque Angloise, 1776, Boston Public Library. Consider the time and place, paying close attention to when something happened and where. What else was happening at this time? What happened before and after this moment? What does it matter where it took place?